← how do you start your day? In March I took an online class called Mondo Beyondo with Andrea Scher and Jen Lemen. It was all about dreaming big. I think this class indirectly influenced so many of the big changes in my life right now. 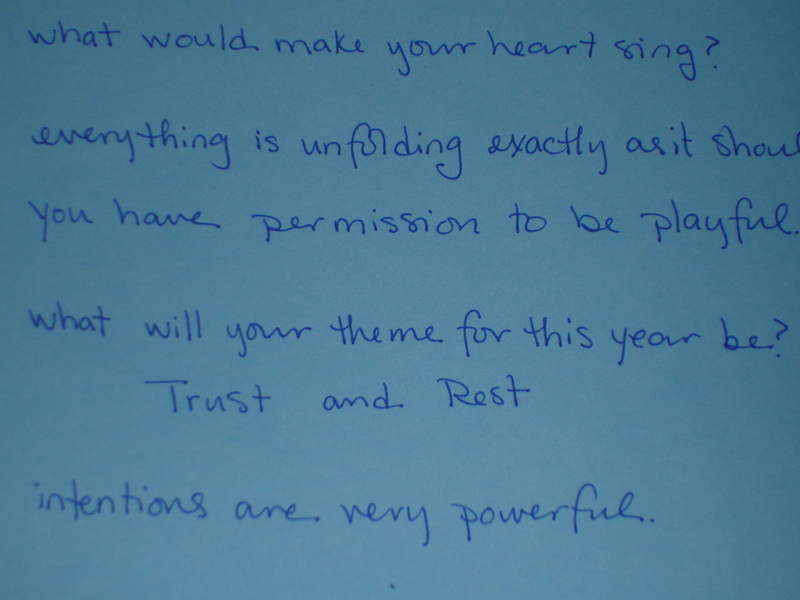 One of the activities we were asked to do was set a theme for our upcoming year and write it in a secret place. I’m a sucker for things like this. I love finding secret wishes months later. There’s something easy on the soul about writing something down and then forgetting about it. My themes were (because I can never be satisfied with just one): trust and rest. These are quiet themes, nothing like adventure or joy or passion. But, digging deep, I knew these were the themes I needed to meditate most on. And now that I’m in transition, moving in with the boyfriend, quitting my job and freelancing from home, and soon going back to school to teach theatre, so many worried thoughts have a way of popping up. It’s so easy sometimes to get caught up in the fear. Fear of making the wrong decision, fear of change, and fear of not being able to do something the way you want. And when these little anxious thoughts pop up, I’ve tried to remember my theme. Trust that it’s all unfolding exactly as it should be. Not necessarily perfectly. I’ve mentioned before that I have a hard time slowing down. With all the changes, I’ve barely had a chance to take a breath. Or, maybe, I haven’t given myself permission to take a rest. This weekend I found myself with SO MUCH TIME and nothing planned. I felt a bit of panic set in. All of my feelings about slowing down or resting came out in full force. “But I don’t want to look like I’m being lazy,” and “What will I tell people I did this weekend?” and “Now’s the time to get to some of those things on my long to-do list.” So what did I do this weekend? I went on a long search for a basil plant, I fell asleep reading a book and took a long nap, I took up residence in a Starbucks for an afternoon, ran into a friend and we had a lovely magical afternoon talking, and I had a picnic with Dave with a beautiful view of the Manhattan skyline. Sometimes adventures, joy, and passion can simply come out of taking a breath and trusting it’s all happening as it should be. My question is do things unfold as they should? Or do they unfold as they do? A blog about passion, courage and a journey deep into your heart's desires. Get dreams in your email!